You’ve chosen how you’re going to make an income and are ready to start bringing in the money honey. But creating a true and profitable business is more than just selling an item to someone who wants it, or at least, there’s more involved, though that is the core of any business or transaction. Disclaimer: this is not to be taken as professional business advice. I’m not a professional business or financial adviser and this shouldn’t be taken as such, this is merely the steps I took on our homestead. I quit my day job and started working from home full time last August (you can catch that here) and I’ve learned a ton in the almost seven years since I first starting my website, writing my first book (check out the first book, The Made-from-Scratch Life and my second book Hand Made), founding the Pioneering Today Academy (you can get on the wait list for the next time we open the doors by clicking here) and earning a living from our homestead. My hope is to share some of what I’ve learned to help you do the same. Listen below to, 6 Tips to Creating a Homestead Business Part 2 #152 of the Pioneering Today Podcast, where we teach families how to grow, preserve and cook their own food using old-fashioned skill sets and wisdom to create a natural self-sufficient home, with, or without, the homestead. Many people get stars in the eyes when they think of running their own business and being their own boss. After all, homesteaders are a special breed that thrive on self-sufficiency, and there’s not many things more self-sufficient than creating your own income. I don’t believe in going into debt, even for starting a business. I’m a cautious soul. According the Small Business Advocacy, about 30% of new businesses fail within the first 2 years and 50% fail within the first 5 years. You’ll find I moved into things with a plan based for growth, to test my idea, without a large amount of cash upfront, a way to proceed without worrying I’d be out a ton of money if it failed, but more importantly, to set myself up properly so it didn’t fail. In the business and online marketing world, you’ll hear the phrase beta-testing. I’m a huge believer in it. It means testing your proposed business or way to earn make money with a small amount of customers first. This allows you to see if there’s true interest with people who will lay down the money, if you’re ready to take it to a larger scale, and to also see where anything is broken or needs fixing before going bigger or longer. 2.Charge from the beginning. When we first start, especially if you’ve been giving your homemade items away for free to family and friends, it can feel awkward to ask for money, but it’s important you treat it like a business if that’s your intent. For your beta-testing, you may charge a reduced price in exchange for people being your first customers and also with them understanding you’re charging less because you’d like their feedback and they’re getting it a special first time discounted rate because of this. You may decide to charge full price for your beta-testing, but only have a limited amount of items for sale. Still let customers know you’d like their feedback and testimonials if they enjoyed the product. This is especially helpful if you plan on doing any type of online selling, even if it’s just on social media. Those reviews and testimonials are very valuable. It’s important you keep receipts and records for many reasons, but especially if you’re creating a business. You’ll need to those receipts and records come tax time. Keep records is important for homesteading, but especially as business. You’ll want to keep track of every expense (so you know how much to charge to earn a profit), breeding records, feeding records to see if changing feed type brings an increase in butcher weight, when it comes to livestock. For cottage type businesses, you’ll want to make notes on recipes. I can’t tell you how many times I’ve made a tweak on a recipe and didn’t write it down, thinking of course I’d remember, and then when I go back to make it again, forget exactly what it was I did. Get in good habits from the get go. You may not decide to grow into a full business, but if you do, you’ll have already established doing things correctly. Make sure you have all the licenses you need, you’re deducting everything you can (but a good accountant is worth it because many people try to deduct things you can’t, and others don’t realize you can deduct things you’re not), you have insurance if you need it, and you’re paying both county, state, and federal taxes/fees when needed. Federal law is you need to report anything over $400 in a year in income. Say what? Most likely there’s already someone in your area who is doing what you want to do. See if you can interview them or better yet, work with them for a few days, to see if you really want to do this as a business and give you a feel for it. If you want to have a booth at the Farmer’s Market, go there and talk to some of the people with booths. What set-ups tend to do well? When do they experience the most traffic? What’s working well for them? What isn’t? Many people will be happy to chat with you. Be honest and say you’re thinking of doing your own booth but wanted to see how it was working for others and to get off on your best foot. If someone isn’t happy to chat, thank them anyways and move on. Before I started the Pioneering Today Academy, I was a guest teacher in another online membership program. It helped me learn how to do video for a course (a bit different than just a Youtube video or Facebook lives) and let me test the waters to see if it was something I enjoyed and would even want to do on a regular basis. I say this because sometimes we stick with something because we said we would (being a person who stands behind what you say is a good thing) but just because you say you’re going to try your hand at selling homemade soap and candles doesn’t mean it has to be forever. If you’re not growing or making enough to cover costs and make a profit, take some time re-evaluate. It may be you need to look at finding new customers or avenues for selling your product. Maybe you need to find a way to get a better price on your ingredients. Perhaps you find yourself making decent money but you don’t enjoy it. You dread making the product or going to craft fairs or setting up a booth. Look at a way to cut out the things you dread or consider not doing it anymore. There’s been many things in my homestead business that I did for way too long when I should have had the wisdom to let them go. 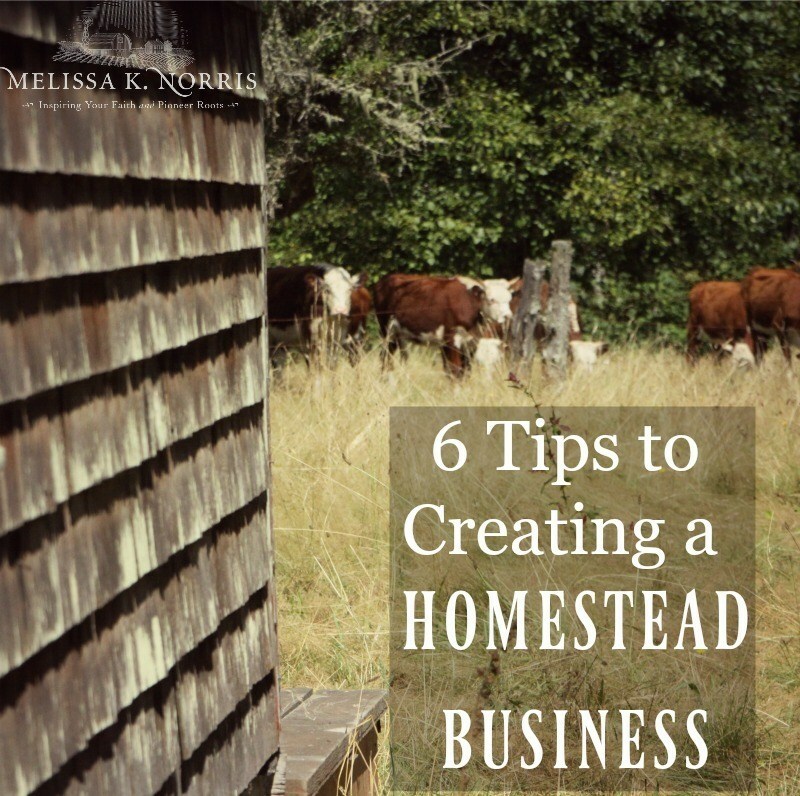 There you go, my 6 tips for starting a homestead business. Are you planning on starting a business or do you have one already from your homestead?